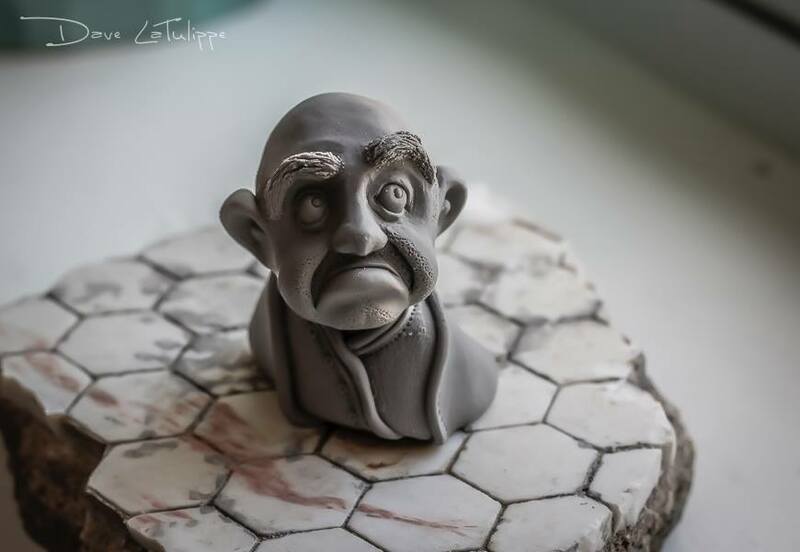 Poetry Friday: “Friends” and Madness! A couple of weeks ago, I shared a poem titled “Jealous Dancer’s Lament,” which I wrote as part of Laura Shovan’s 6th Annual February Daily Poem Project. 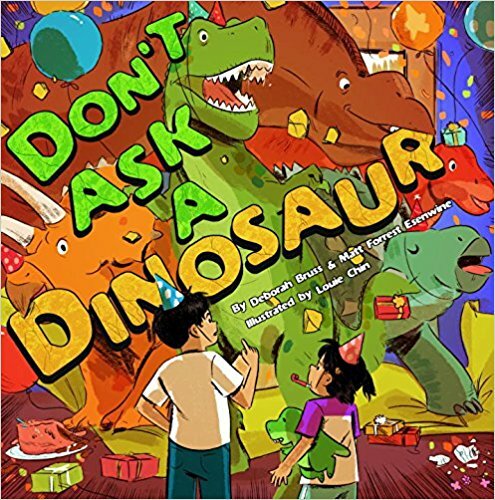 I’ve been busy this month writing and doing a lot of behind-the-scenes promotional work for Don’t Ask a Dinosaur (Pow! 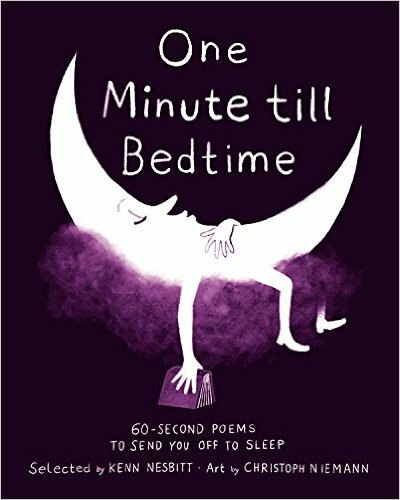 Kids Books), but fortunately I have been able to find enough time to write a few more quick poems to share with the group. As I mentioned previously, Laura’s poetry prompt is not about perfection. It’s about getting into the habit of writing daily – something a person like me has a hard time doing as a stay-at-home dad with an 8-year-old, a 4-year-old, a voiceover business, and myriad household chores that are still waiting to be done. I just connected with that attitude and with our collective, unceasing desire to be happier, better, and more successful than our so-called “friends” on social media…and this is what came out of it. yet, my heart holds sore resentment. 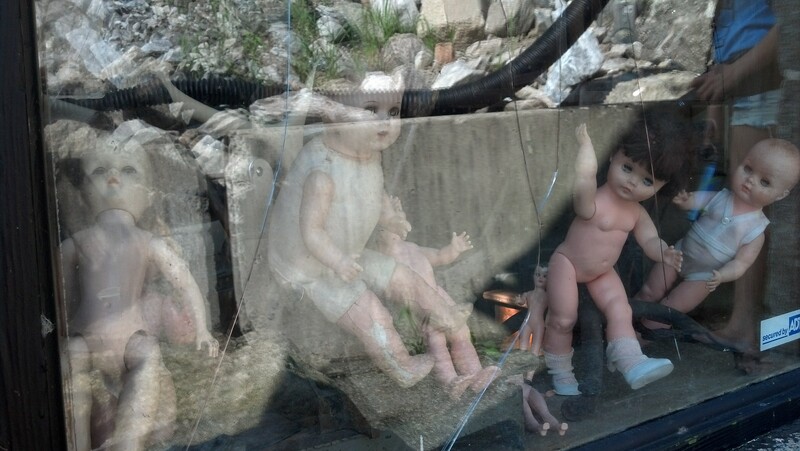 why, Lord, have I been forsaken? By the way, speaking of poetry prompts, Ed DeCaria’s Madness! Poetry competition will be starting soon! Sixty-four “authletes” (including Yours Truly) will be given random words – and just 36 hours – with which to craft children’s poems. It’s a unique, bracketed-style writing competition, and you can join in by voting for your favorite poems as we battle it out, head-to-head throughout the month, culminating with the final showdown between two truly worthy opponents. Click HERE to see the names of all 64 authletes and who they are paired up against, or click the logo above to learn more about the rules. If you are a teacher or know of a classroom that would like to learn more about poetry and writing and would like to participate by voting, please contact Ed! Each year between 100-200 classrooms participate, and we’d like to see that number grow. 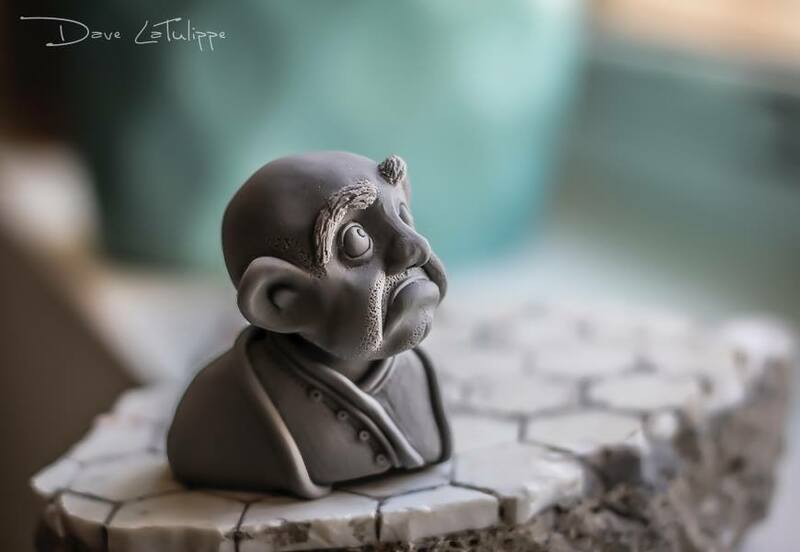 I hope you’ll consider following the competition and voting! And again, if you’re looking for more poetry, head over to Renee’s blog, No Water River, for today’s complete Poetry Friday roundup. Last Friday I told you about Laura Shovan‘s annual writing-prompt project known as the February Daily Poem Project. This year, those of us taking part are writing ekphrastic poetry: poetry inspired by (and often written to accompany) a piece of visual art. 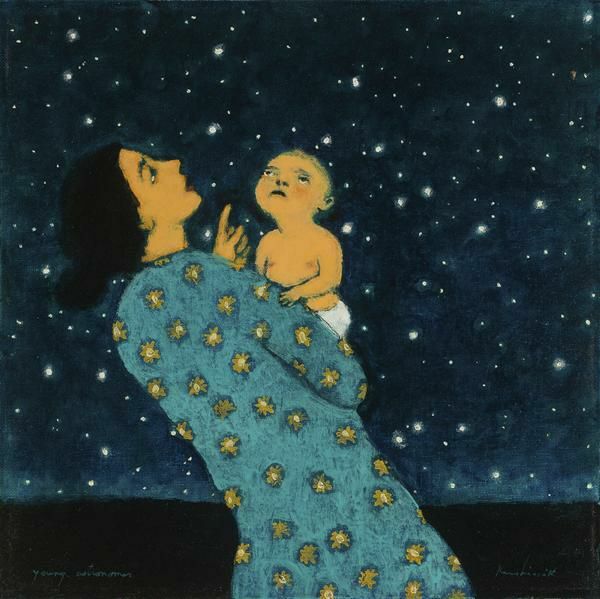 It was a rather pensive, thought-provoking sort of poem I shared, inspired by a painting by artist Brian Kershisnik. So this week, we’re going a little more light-hearted! for oh, so long – God only knows. I’ve had it with this Rodin clown! At least the Thinker’s sitting down. 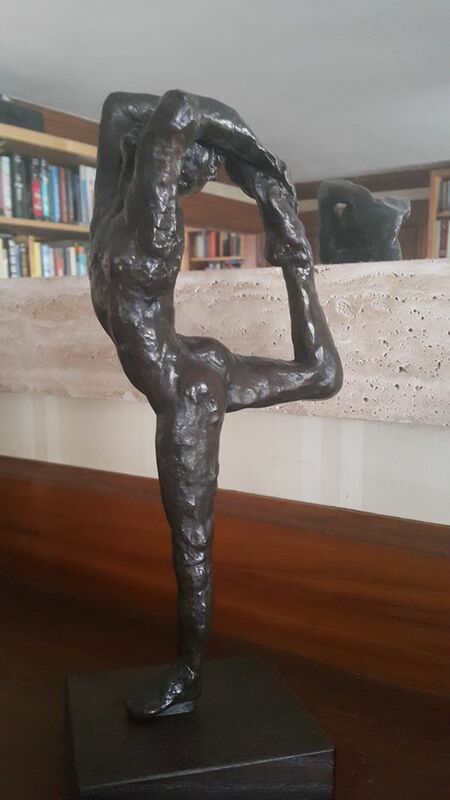 Yes, the model for Rodin’s classic, The Thinker, seems to have had it much easier than the poor chap who had to model this pose – which, interestingly, is a yoga pose known as The Dance Pose! (What’s even more interesting is that Rodin didn’t really care for ballet all that much – he preferred free movement like much of what became modern dance.). 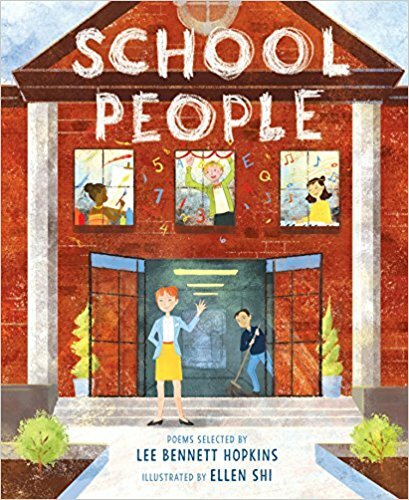 School People (Wordsong), Lee Bennett Hopkins’ new children’s poetry anthology, arrives Feb. 13! 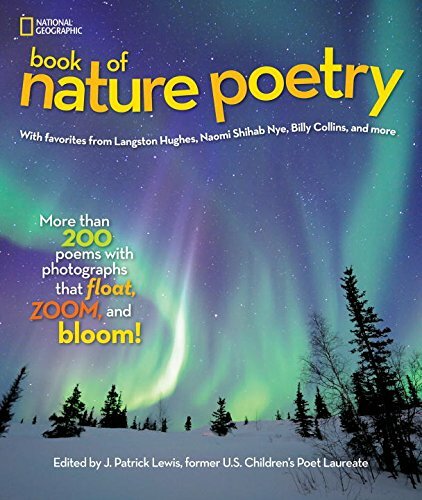 Edited by Flashlight Night editor Rebecca Davis, this book includes 15 poems about the grown-ups that children meet at school…including my poem, “Bus Driver.” I hope you’ll consider picking up a copy! Writer/poet Laura Shovan has an annual writing-prompt project she calls the February Daily Poem Project, and those of us who sign up to take part in it can visit the official Facebook page for a daily dose of inspiration. This year, the focus is on ekphrastic poetry; that is, poetry inspired – and often written to accompany – a piece of visual art. A few days ago, we were doing some “warm-ups,” so to speak, when a painting by Brian Kershisnik caught my attention. A number of other folks had already written their responses to the picture, but before I read any of theirs, I wanted to get mine written; I already had an idea in my head, and it needed to get out. …………………with all its mountains, trees, and shores. Donna at Mainely Write is hosting Groundhog Day – err, I mean, Poetry Friday! – so head on over to her little spot on the web for the complete roundup! Book review: “The Last Fifth Grade of Emerson Elementary” ARC Tour concludes here! Just 2 months ago, on April 12, author and poet Laura Shovan celebrated a book birthday: her debut middle grade novel in verse, The Last Fifth Grade of Emerson Elementary (Random House Children’s Books) was officially released, and the reviews have been overwhelmingly positive. In advance of the release, Laura began a blog tour of her ARC (Advance Review Copy), in which children’s lit bloggers across the country could read the book, share their thoughts on it, and pass it along to the next blogger. Well, it all wraps up today, as I’m the final blogger on the tour – and I’m so happy for Laura! It’s an engrossing book, detailing the lives of 18 students in Ms. Hill’s class and their personal struggles and joys with themselves, each other, and the fact that the school board has announced that the school will be closing at the end of the year to be turned into a mall. Each poem is told from a particular student’s point of view, which allows the reader to get to know the characters intimately well. George Furst, for example (whose middle name is Washington thanks to his history-loving parents), is running for class president but wishes his mother and father had not divorced. Hannah Wiles is the Type-A, in-charge, know-it-all who, aside from also running for class president, is also struggling with parental issues. Brianna Holmes, meanwhile, is creative and proud – and homeless. Newt Matthews has Asperger’s. Through each of their poems, the individual students’ personalities develop over the course of the book, and it’s nice to see their progress and level of maturity by the time the last poem ends. Both funny and poignant in turn, The Last Fifth Grade is a touching book that is as easy to read as it is as easy to get lost in. I do have to admit, the students seem far more worldly and mature than my fifth grade class! In fairness and honesty, the only disappointment I have to note (and I hate to even mention this, as we’re talking about my friend, Laura’s, book!) is that three of the eighteen students are dealing with the lack of a father in their lives: George Furst, whose dad left the family earlier in his life; Hannah Wiles, who has to live with her dad while her mom is stationed overseas, and Mark Fernandez, whose father passed away. Perhaps it’s because I’m a stay-at-home dad who works out of the house – hence, I’m a bit touchy on this subject – but no one seems to bemoan living with their mother. Yes, there are some very commendable dads in the book, and I appreciate Laura’s implication of the importance of fathers; I just think it would have been more balanced had there been at least one home that was happy with their dad, even though mom was absent. But that’s a minor quibble. The importance, of course, is the interaction of the students and their growth throughout this transformative year. 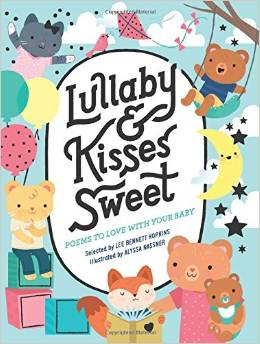 Through rich yet kid-friendly language, well-crafted characters, and a wide array of poetic forms (from free verse and haiku to sonnets and limericks), Laura tells a tale that kids will want to follow from first page to last! I’m very excited about this year’s conference – not only because the conference is a wealth of information and networking possibilities, but because I’ll be presenting my first conference workshop this Sunday: “Free Yourself with Free-Verse Poetry.” And the timing couldn’t be better, as I just learned a few days ago that a free verse poem of mine was a runner-up in a national contest sponsored by the Young Adult Review Network! 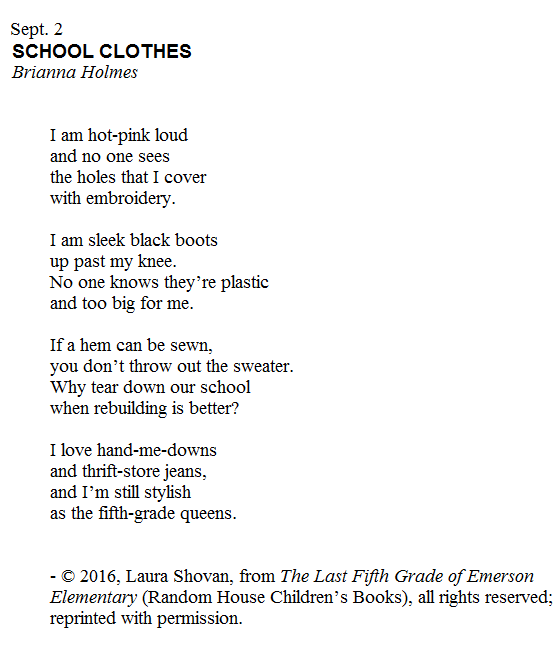 Poet, educator, and blogger Laura Shovan is celebrating a monumental accomplishment this month: the release of her debut middle grade novel-in-verse, The Last Fifth Grade of Emerson Elementary (Wendy Lamb Books), which was just released a couple of weeks ago. Congratulations, Laura! Part of Laura’s celebration has included a fun little poetry challenge she created for Twitter, called #My5thGradeAsHaiku. Anyone who wanted to share their memories of 5th grade was invited to write a haiku (well, technically, a senryu, but we won’t split hairs) and post it on Twitter with the #My5thGradeAsHaiku hashtag. And she got a BUNCH of responses! As I look back on it, 5th grade really wasn’t much of a hoot for me – but neither was 4th or 6th, for that matter. Ah, well. For today’s complete Poetry Friday roundup, head on over to Buffy’s Blog, where Buffy Silverman is hosting the festivities! 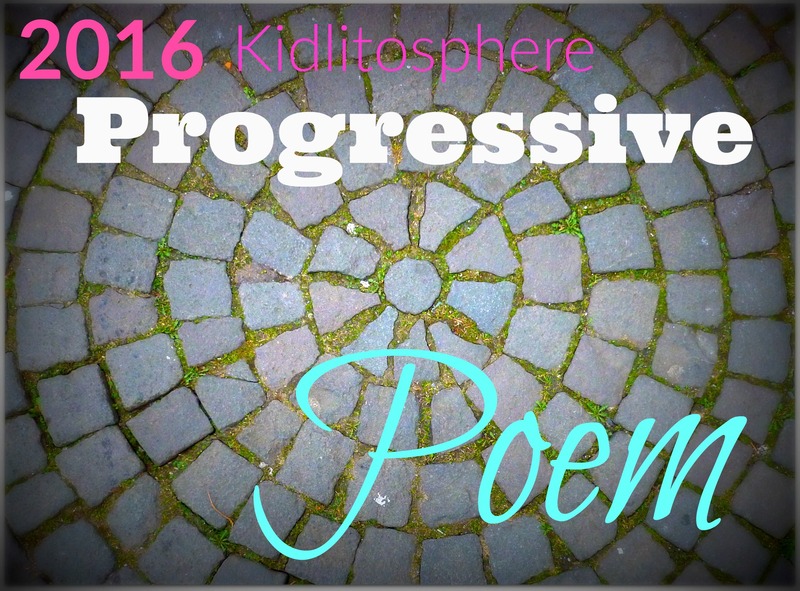 Irene Latham‘s annual Progressive Poem is almost ready to wrap up! A different writer adds a line each day – and we’ll see how it all turns out tomorrow, with Donna from Mainely Write! But let’s not get ahead of ourselves; today, Sheila Renfro is adding her line…be sure to visit and see how the Progressive poem has…progressed! Before I get to today’s poem, I want to remind you that if you hadn’t had a chance to check out my interview with Irene Latham this past Tuesday – and my review of her new book, When the Sun Shines on Antarctica: And Other Poems from the Frozen Continent (Millbrook Press) – make sure you CLICK HERE to read it and enter to win your very own signed copy of the book! So here we are, almost 3 weeks past January, and I just remembered I’d wanted to share this…but better late than never, right? I wrote this a few years ago, when the typical New England “January Thaw” lasted a few days – usually around the latter half of the month. This year, the January Thaw was the entire month of January! one can catch a glimpse of spring. as the air begins to warm. But wait – there’s still plenty more poetry around! You can visit Laura Shovan’s blog for the latest in her February prompt series, the Found Object Poem Project – see the projects, see what folks are writing, and then join in yourself! And of course, be sure to stop by Donna Smith’s Mainely Write for the complete Poetry Friday roundup! Poetry Friday: The Found Object Poem Project, Day 5! Poet and blogger Laura Shovan is once again inspiring writers with her annual February poetry prompt, and this year she’s using “found objects” – random, unusual, or even everyday items that various friends and fellow bloggers have come across and shared. You can see all of this week’s objects (and the poems written so far) HERE at her blog, and today, I’m pleased to host Day 5 of the series! Now, normally I’d share the photo of the object with my poem, along with all the poems that readers have contributed – and please DO contribute, in the comments section! – but I feel a need to do things just slightly differently, for good reason. This time around, I need to share the poem first…and I’ll explain why after you read it. The reason I wanted to share the poem first is because of the ridiculous nature of the photo. Once you see it, you’ll sense a huge disconnect between the object and the poem. Ready? When I first shared this online, I stated that I’d never been mooned by a vegetable before! I’m not sure if this tomato was one big one that split into two, or started off as two little baby tomatoes that fused into one – but at a good pound or so in weight, it was one of the strangest-looking tomatoes I’d ever seen. Two days ago when I started thinking about a poem to write, my mind kept wandering back to a tomato ‘mooning’ me – but I wanted something more serious. Once the title of the poem, “Heirloom Moon,” hit me, the poem wrote itself. I was concerned that by seeing the photo, then reading the poem, there might be a bit of a disconnect. Switching from a goofy picture to mature free verse – and switching from very different definitions of ‘moon’ – was a challenge! Now then, without any further ado, allow me to present YOUR poems…all the responses to this photo that are being sent in. And please, if you’d like to contribute, just post your poem in the comments below and I’ll add it here as soon as I can! of a sunny April day. Margaret Simon says she was attracted not to the tomato but to the quilted cloth beneath, which was reminiscent of her grandmother’s quilts. This touching poem is proof that inspiration can come from anywhere! feathered with fingers of love. Carol Varsalona jumped into the fray with the following poem that she titled after my picture! Not two peas in a pod. Next, Mary Lee Hahn brings us a short but sweet love poem! but together we’re unified — one outranks two! Donna Smith is “tasting the rainbow” – and a very delicious-sounding one it is! Rain down to my elbows. And finally, Charles Waters brings us back to my initial impression of the “moon” as the subject, as opposed to a tomato. The personification in this is intriguing! What’s in a Blood Moon? evening wear, he starts blushing with pride. Wondering what’s in store for tomorrow? Here’s the found object poem prompt for Sat., Feb. 6, courtesy of Laura, herself! Many thanks again to Laura Shovan for the series of prompts this month, and for all of today’s poetry fun and links, please visit Tricia Stohr-Hunt at The Miss Rumphius Effect for the Poetry Friday roundup!